mommy's reviews: Dial Global Hand Washing Day Is Coming Soon! October 15 is Global Handwashing Day, a global advocacy day dedicated to increasing awareness and understanding about the importance of handwashing with soap as an effective and affordable way to prevent diseases and save lives. Global Handwashing Day is an opportunity to design, test, and replicate creative ways to encourage people to wash their hands with soap at critical times. 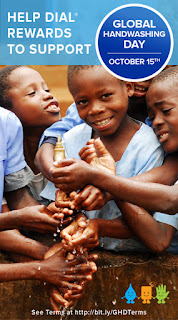 To participate in this day, Dial has started a great campaign to help these developing countries teach people about good hygiene through proper handwashing. Login or sign up at Dial Rewards and use the code "WASH9". Dial Brand will donate $1 for every code entered (up to $50,000) to support global handwashing education. Amazing!! So, head on over and sign up today...be a part of a greater mission that is sure to impact our world for the better.